In Malaysia, most stocks are either government controlled, EPF's involvement, or family controlled with many of the family members in the board - uncle, aunty, nephew, niece, sister, brother etc. 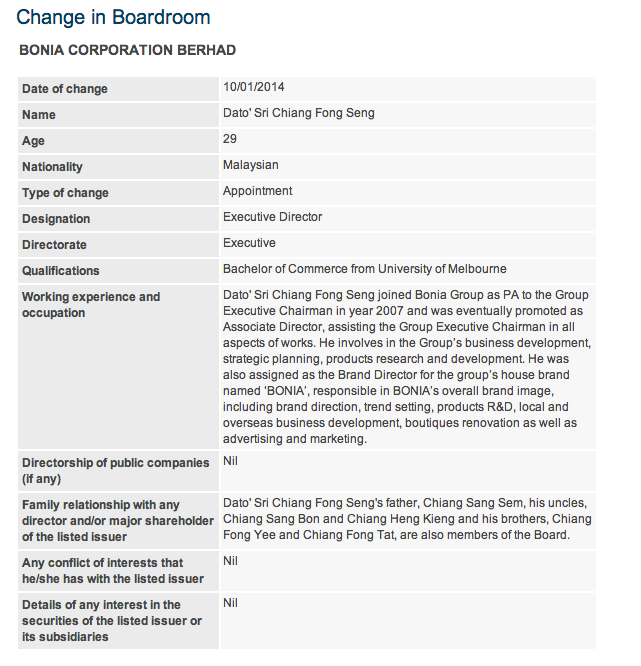 Bonia now has 6 family members in the Board. I am just wondering a 29 year old Dato' Sri. Quite an achievement. He must have contributed a lot to the country. Don't see that many in US or Europe except maybe Donald Trump's. Note that Padini which I am currently holding has that same problem. Someone forgot to tell them these are public listed companies. How can there be less family involvement? You must bear in mind that children of successful entrepreneurs must naturally be able to excel in managing large corporations. They in turn will be able to produce business geniuses that will continue the transformation of these companies into large MNCs. I am seeing the Tiger Wood's, Micheal Jordan's and Lee Chong Wei's kids to be the next golf, basketball and badminton champs. If not family, then who to trust? Malaysian entrepreneurs who built up the original family business into a small plc still still think of it as a family enterprise. the chia's family also is also controlling QL business. I don't see anything wrong passing down the business to the next generation if he/she/they have the right attitude and knowledge to perform. There are many successful examples in Malaysia. The key is about the process of grooming. For Bonia's case, the young Datoship is questionable but its a norm in Malaysia. Ability wise, it is still too early to judge though it is risky to have a young director. I think we should not moan over the issue as the family has almost 50% shareholding on the company, which makes it a de facto family company despite of its listing status. If anyone is not satisfied with the board appointment, either  sell the shares (if you are shareholder) or  buy enough shares to overrule the board. Do not agree with Mr Fung. It's equivalent to emigrating if you are not happy with this country mentality. Modern corporate governance dictates that the shareholder with even a single share has the same rights as the controlling shareholder with millions of shares. We are no longer in the dark ages of corporate development. If indeed family owned companies are the fiefdoms of controlling families, the legal and moral solutions are not to list the business or if they are already listed, to take them private at fair and reasonable prices. The management should select and appoint officers for the best interest of the company, not for the best interest of their family. There are some cases where the 2nd generation are even better than the 1st generation, such as in YTL. Most of the time however, the 2nd generation does not really need to prove themselves. Normally there is only one or two who are critically important and the rest are just there to make the numbers. Sad to say that this is a chornic weakness of Asian. If these family members are just sitting on the board, the damage is still rather limited. If they are directly involved in operations, the company has limited future and success. - I think it is unfair to compare migrate-if-not-happy with exiting an investment. Migrating elsewhere is a painful process, selling shares is not. - Whether modern or classic, one share has no same right with million shares. 50% shareholder has more say than 10% shareholder, fair and square. The minorities can sue the management/board if they do something abusive or illegal. Other than that, proxy fight is the only way to overrule any major corporate decision (such as M&A or board appointment). - Don't get me wrong, I'm all but against bad corporate governance (be it family-controlled or not). My point is, there are two ways to solve the issue i.e. avoid investing in the bad CG company or initiate an aggressive proxy fight like the activists Carl Icahn and Bill Ackman. - Sometimes, family business is good investment because their owned big portion of the cake and they will not screw it up. However, prudent judgement must be exercised on evaluating them. Mr. Fung. Terribly sensible answer as always. While I agree that in stocks one would easily be able to get in and out - which is also why I prefer stocks than properties. Properties, if one has made any mistakes, it would be more difficult to sell, although it is not impossible. However, I still believe in some form of stocks investors activism which is part of the reason why I have this blog. Problem with many Malaysian/Asian companies, listed or not, is that they , the owners , do not differeniate much between ownership and management. Companies with plenty of family members in management invariably ended up squabbling among themselves. Look at Kian Joo, Tan Chong etc etc, and, bet you, more to come. And many companies put their offsprings into management without a thought on their abilities or experiences. And many are incompetent and reckless. So , Mr Fung, nay to you.